The Hudson's Bay Company established a post at Kamloops in 1812. A short while later another post was established at Little Fort. 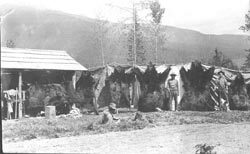 Canadian Aboriginal people were the first to use the North Thompson route followed later by a party of settlers who, after leaving Jasper, travelled a route by land to Kamloops. After their safe arrival, they became known as the Overlanders. Prior to the establishment of the town of Blue River, a large forest fire engulfed the valley. Therefore, the forest surrounding the town of Blue River is all second growth. 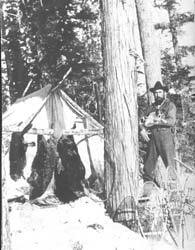 In 1890, Frank Bowen was one of the first settlers known to have trapped in the Blue River area. 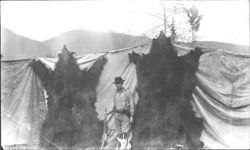 Later settlers were Dan Crowley in 1909, the Lawson brothers and their partner Wilkins in 1910. In 1910, J. Maher arrived in the area. He set up a cabin 11 miles east of Blue River, which is still visible today near Highway 5. Other settlers who arrived to the area around the same time were Austin Cook, Smith and J. Dales. Mt. Cook was named after Austin Cook's son. Stanley Harrison (Doc) arrived in 1912 with Angus Horne. Together they acquired an area of land, which included Goose Lake, Doc later had a daughter who was the first Caucasian child born in Blue River and Goose Lake was then named Lake Eleanor after her. Lake Eleanor is at the centre of Blue River and is admired by locals and tourists alike. It is a great spot for recreation especially swimming, fishing, and picnics. When the Canadian Northern Railway (CNR) connected the east and west in 1914, Blue River became a divisional point. Each week two trains passed through Blue River. As the many small railways across Canada became unified in 1923, Blue River became part of the Canadian National mainline. The first section foreman was Billy Davies. A wagon road was built during the construction of the railway. The total number of families living in Blue River at that time was seven! Dave McLaren established the first store in 1922 across from the railway station. Johnny Kuffa built the first hotel. There were many other long time residents including: Mrs. S. Harrison, 1919; Mr. J. Jones, 1923; Mrs. T Barron, 1924; Mr. H Bilton, 1924; and Mrs. M. Nelson 1928. We cannot forget the many other pioneers along the way who have contributed to the development of the North Thompson Valley, as well as the local community members who continue to make Blue River the beautiful place it is today.